Background: The sliding genioplasty operation is a well known chin procedure that is capable of making multiple dimensional augmentative movements. It gets its name from the original description of how the procedure was done. 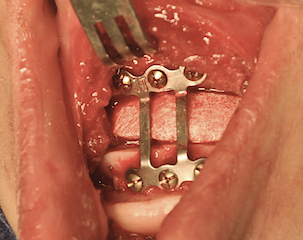 Using an intraoral angled bone cut, the donfractured chin segment was moved forward along the osteotomy cut. Because wire fixation was originally used, intimate bone contact was necessary and the bone truly did ‘slide’ forward along the osteotomy line. By virtue of the angle of the bone cut and the use of wire fixation, the chin is also going to vertically shorten a bit as it comes forward. How much shortening occurs depends on the slope of the angle of the bone cut and how much horizontal advancement is done. But in larger horizontal advancements, those that encompass the whole thickness of the chin bone, vertical shortening is inevitable. In some patients this is an aesthetic objective while in others it may be an aesthetic disadvantage. In contemporary sliding genioplasty surgery, plate and screws are used and not wire fixation. This changes completely how the chin advancement is done and iin how ts dimensional changes are controlled. With a plate and screws chins can be brought forward and either vertically shortened or lengthened…it is all about the size of movement and how the plate is bent. Thus there is much less reliance on how how the bone cut is made. Case Study: This young male had a prior history of a sliding genioplasty for a small chin. It brought the chin forward the full thickness of the bone and was wired together. While offering improvement, the chin remained horizontally short as well as vertically short as well. A secondary bony genioplasty was planned that offered largely vertical elongation with some further horizontal increase. Under general anesthesia an intraoral approach was used to expose the well healed chin osteotomy site. The bony step off was filled with scar tissue. The scar tissue and wires were removed. The osteotomy cut was redone and the inferior chin segment mobilized. The chin was brought forward 5mms and vertically lengthened 8mms. An hydroxyapatite interpositional block graft was placed for both healing and stability purposes. 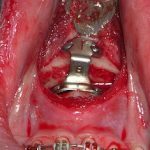 This case illustrates that plate and screw fixation of advanced chin segments are more versatile particularly when the vertical length needs to be maintained or increased. 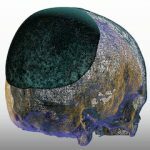 It also illustrates the the original bone can be redone without any issues of poor bone quality or subsequent healing issues. 1) A sliding genioplasty may inadvertently shorten a chin as it is brought forward if wire fixation is used. 2) A secondary sliding genioplasty can be performed to vertically elongate the chin and move it further forward. 3) In significant vertical bony chin elongation, an interpositional graft is used for both stability and to expedite bony healing.